"Resurrection," the first album in over 20 years from the legendary Hawaiian band, sounds as though they'd never stopped recording. "Resurrection" is nine solid tracks of classic hard rock in the vein of Van Halen, Aerosmith and more recent incarnations of Deep Purple. The CD is full of irresistible riffs, soaring melodies and fiery leads, all buoyed with stunningly high levels of production. The band originally recorded three albums from 1984 - 1986 and the beauty of "Resurrection" is that it seems to pick up exactly where "Is Nothing Sacred?" left us twenty-one years ago. Sadly, drummer Kevin Lum died of diabetic complications in 2002. But the band pays tribute to him here, using samples of drum sounds recorded by Lum prior to his death. It may sound hokey, but it works really well. 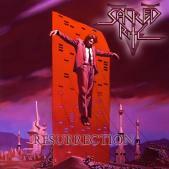 Fans of the band's previous work will find themselves right at home with "Resurrection" and those who prefer the classic sound of heavy metal will want this ... and previous albums and compilations by Sacred Rite ... in their collections as well. Sacred Rite: Mark Kaleiwahea - Lead Vocals, Guitars; Jimmy Caterine - Guitars, Backing Vocals; Peter Crane - Bass, Keyboards, Backing Vocals; Kevin Lum - Drums, Percussion. For more information, check out http://www.sacredrite.com or http://www.myspace.com/sacredrite.